When you put your house on the market with an estate agent they will normally arrange for photographs of your property to be taken with the aim of showing your home in the best possible condition, maximising the asking price and final sale price with the images appearing on the web and in the brochures handed to house seekers. If you have decided to sell your house yourself or want images that are better in quality than the images taken by estate agents you will need some basic equipment and know how. There is a good chance that you will already own a digital camera, probably a small compact one, and will snap each room in turn from a variety of angles. While you will have captured how your house looks you will probably be left wondering why they are not be of the same quality as those taken by the professionals. 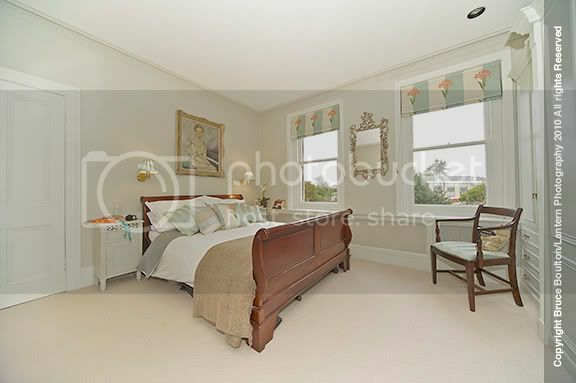 There are 3 key elements to achieving great images of property, 1)A well styled and presented home, 2) a camera capable of taking wide angled images and 3) good lighting and photographic technique. **A well styled and presented home. **You need to show your home off, making it look as good as possible. A house is probably the single largest purchase you will make, we all aspire to move to a larger property or a property that is better than our current one, and you want to present your house so that when potential buyers see the images of your house they will want to have a look at it in person. If you understand the value a well presented house can add to the asking price then I would recommend getting an expert such as Helen Silver from The Property Styling Company to give your home the once over. **A camera capable of taking wide angled images. **Assuming for the moment that you are using a compact or bridge camera (where the lens is not removable) you will have a fixed 'zoom' range. The zoom range of a lens is traditionally described in relation to a 35mm (the 35mm here refers to the size of the film/sensor capturing the image) SLR camera and the ideal zoom range for taking photographs for property sales is between 12mm and 24mm. The two images below show the difference 12mm makes to an image, the first image is shot at 24mm and the second image has been taken at 12mm. You are probably now thinking how does that relate ot my compact camera. 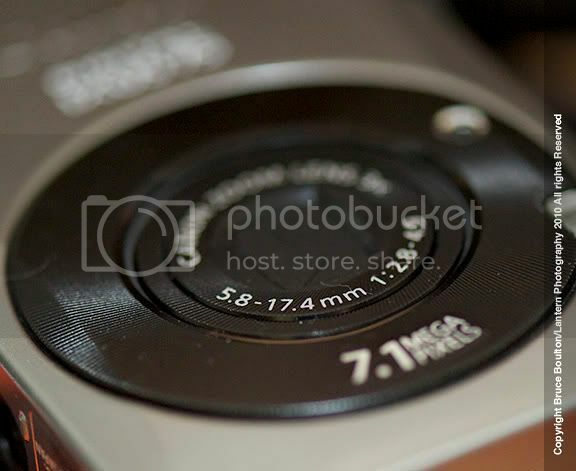 When you look at the front of a compact camera you will probably see something as shown below. The key to working out the zoom range is the text, 5.8 - 17.4mm, however unless we know the sensor size it is impossible to convert this figure into one that relates to a 35mm camera. The solution is to have a look on the manufactures website or a camera review site where you should be able to find the zoom range expressed as an equivalent to 35mm, for my compact camera the equivalent zoom range is 35mm - 105mm and because of this it is not suited to shooting property photographs. If you own a SLR, digital or film, then you will be able to buy or rent a suitable lens that is wide enough to photograph the rooms in your property. All the camera manufactures sell their own lenses but you can buy lenses from Sigma, Tonika or similar 3rd party manufactures that will be equally suitable. One point worth remembering is that only a few high end digital cameras have a 35mm (full frame) sensor and so these cameras with a smaller sensor give the appearance of 'magnifying' the image. The conversion factor is about 1.5 for Nikon cameras or 1.6 for Canon cameras and means that a 12mm lens on a Nikon D90 would be equivalent to 18mm on a 35mm camera. You will probably be wondering how many Mega Pixels (MP) your camera requires in order to capture a usable image, while camera manufactures will tell you that only the latest 20MP camera will do the truth is for web based images and images that are going to be printed no larger than 6"x4" a 3MP camera will do the job however I recommend any camera between 5MP and 10MP. Good lighting and photographic technique. Nobody likes dark and dingy houses and so the photographs you take need to be well lit and free from harsh shadows. Depending on the type of camera you are intending to use you may be limited in how you can achieve the desired result. If you are using a compact camera the chances are that you will have limit manual control and will only be able to use the built in flash. The problem with this limited control is that either the images are blurry because of the length of time the shutter is needed to be open or that it s obvious that the room has been lit by flash. To get the best possible results try shooting the house with an overcast, but not dark. sky as when the sun shines directly through the window it can create harsh shadows in the room, unwanted lens flare (this is where the sun is reflected with the lens itself) or windows that are 'burned out' loosing the detail of the window frames. 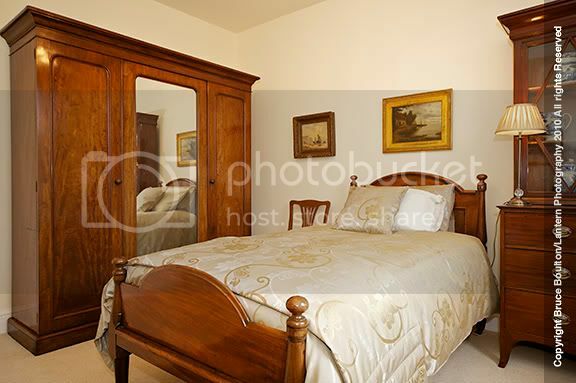 When photographing the room you need to be aware of converging angles, this is where the walls appear to meet at a singe point, for good results ensure that walls remain vertical and do not lean to the left or right of the image. Ideally you need to place the camera onto a tripod that has spirit level incorporated into the head as this will allow you to set the camera so that it is aligns 90 degrees to both the horizontal and vertical axis. In other words you need to ensure that the camera does not point up or down and is not rotated around the lens. Once you are happy with the position of the camera you can get the lighting correct. For compact camera users the range of camera controls is limited so to get the best possible results you should turn the flash off and have the largest window in the room behind you and should try and focus the camera on an object a 3rd of the way away from you. Where it is not possible to have the window behind you make sure you focus the camera on the darkest part of the room, this may lead to the windows being over bright but the interior will be correctly exposed. If you were to focus on the brightest part of the room (or too near the windows) you may find that the room is too dark but you get a clear image of the gardens outside. If you have a camera that allows you to use an off camera flash then you can improve the appearance of the images by balancing the light outside with the amount of light in the room. To do this you need to set the shutter to stay open long enough to correctly expose the light outside the window and set the flash to add enough light to the inside of the room so that the resulting image is correctly exposed. The result should look natural and without harsh shadows from the flash, this may require a bit of experimenting with the location of the flash as well as how long you leave the shutter open for. 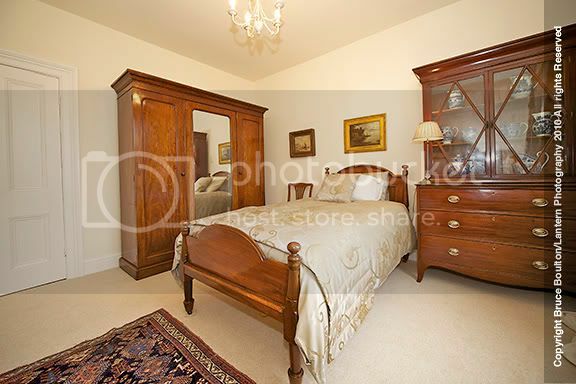 The above image is an example of how your images should look, the lighting is balanced and even with no harsh shadows. The colour balance is correct and the subtle shades of the wall can be made out. Obviously I use a professional camera and this image was taken using my Nikon D3 with a 12mm-24mm Sigma lens, supported by a Manfrotto Tripod, and with a Nikon SB800 flash. The shutter was set to 1/60th of a second and a focal length of f5 was used. If you are using a digital camera then experiment with different settings and keep taking pictures until you get the desired image.